It took me only one afternoon to make this set. The yarn is Alize Maxi Flower and I used 2 skeins. Pretty. I have never seen that yarn before. Was it hard to work with? Nice set! You are a much faster knitter than I am. No, it's quite easy to work with, it's just thick, but the flowers are ok. I'm crocheting a Hello Kitty scarf for one of my nieces, knitting a dishcloth for my own kitchen, and knitting a neck gaiter for my husband. 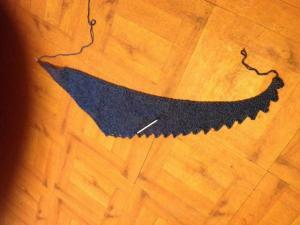 I'm working on a knit scarf/shawlette. The pattern is written for sock weight yarn, but I don't have any and since I wanted to use up some of my yarn, I am using Caron Simply Soft. I just won't do as many pattern repeats. Pattern is called Hitchhiker. I'm working on a pair of socks. Learning the magic loop method. Yup, I agree that it gets v-e-r-y boring! I think I will like the finished project, but I'm having to force myself to work on it. I won't be using it this winter! Knitting up a leftover ball of camo yarn into a beanie...this is taking FOREVER! I don't have enough yarn to crochet it, but keep thinking "This would be so much faster in crochet!"